There is nothing more enchanting than a baby's little hands and feet. Happy hands can now enable you to preserve this memory with a stylish and affordable range of products. The ingenious Babysafe inkless kit helps you take the prints quickly and without mess from the minute they are born. 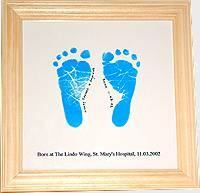 Have your baby's hand and foot prints on Birth Announcement, Thankyou or Christening cards, Ceramic Tiles and Mugs, and also the essential Footprint Certificate for your baby book. All these products make great gifts for a newborns, Christenings or toddlers. It's never too late to take your baby's hand and footprints!